Fusion folk americana from this award-winning acoustic singer songwriter duo. Their music is called "Fusion Folk Americana' - a blend of many different elements that comes from their vast and wide-ranging musical backgrounds. 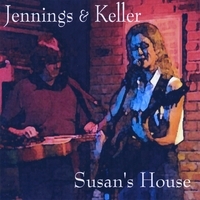 With the release of their debut CD, 'Susan's House', Jennings and Keller are quickly gaining recognition throughout the country. In 2007 alone, they were finalists in five songwriting contests across the nation: South Florida Folk Fest, Suwanee SpringFest, Susquehanna, SolarFest, and Falcon Ridge Folk.